They say the Kicking Horse River gets its name from a fella that, while on the river, actually got kicked by a horse and was knocked out for days and nearly died but lived to ride on…wonder if he didn’t put the horse bit in just to make himself look good when the truth is that he got pommeled by the Kicking Horse’s class 4-5 rapids! 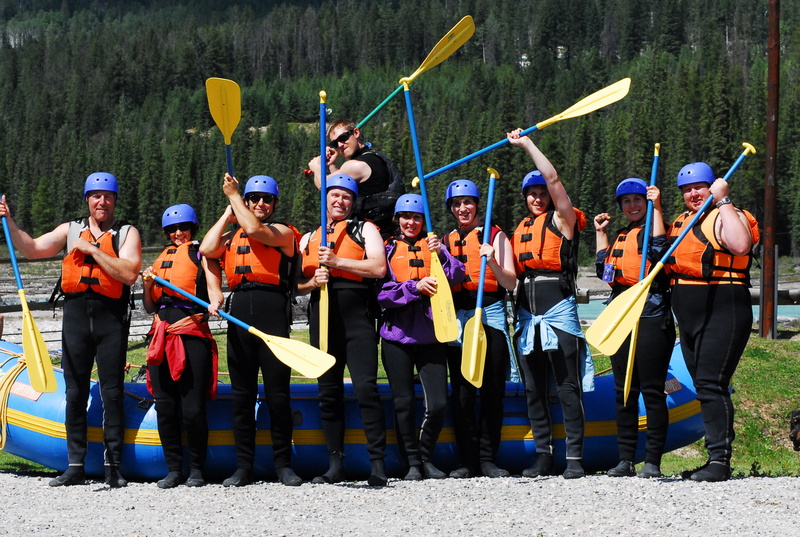 Thanks to Swarm Jam I got a smoking coupon that hooked us up with Hydra River tours http://www.raftbanff.com/ for what would be one of the most spectacular afternoons of my life- hands down LOVED rafting- and would do it again- in a second. Hydra tours is between Field and Golden just on the cusp on Yoho National park. 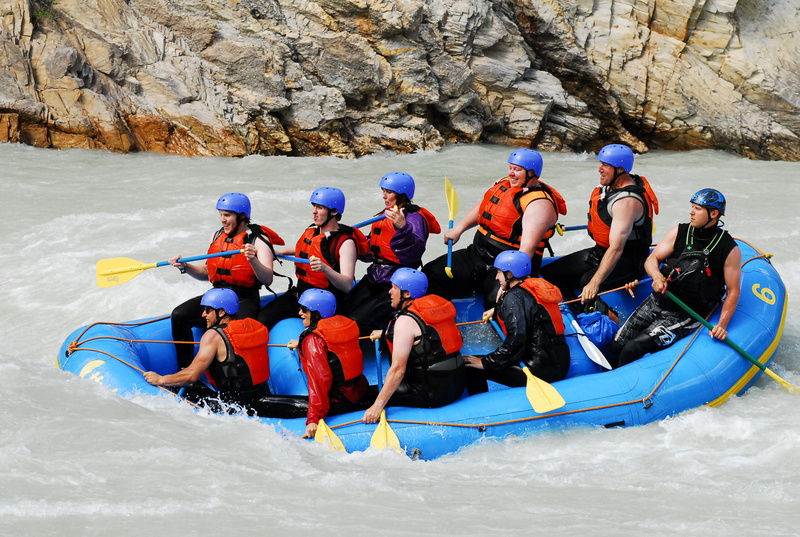 A spectacular drive from Calgary and you are at the rafting mecca of Western Canada. Our first order of business was a BBQ lunch held at the Hydra base. It was a great spread actually featuring burgers (meat and veggie), salads, veggies and dip and dessert squares. After fuelling up we were brought together for the “safety talk” my goodness the guide who did this was hilarious – he delivered dry and normally uninteresting/scary information in a fun, upbeat, easy to understand and practical way. I felt that if I and my raft parted ways I would know what to do and that is what counts at the end of the day. After the safety brief is was on to the wetsuits -oi- not a good look for anyone! Hydra provides boots, wetsuits, helmets and paddles. You supply the bathing suit to wear underneath. If you are always cold – like me – ask for a splash jacket – remember the Kicking Horse is a glacier fed River and the water is frosty. Even on our warm summer day the water temperature was only about 5C which is truly nippy water. With the safety brief under our belts and every bit of cellulite exposed in the wet suit we were split into groups and sent to meet our guide. Kyle was our host for the day and he was funny, knowledgable and a great teacher. At Hydra we put in right at the base camp so we had a good long float before we ever saw any action and this was a great way to meet each other, learn about the raft and how to paddle and just enjoy the beautiful scenery. Now if you are looking for action-sit in the front of the raft as this is were it all happens! The two people on either side at the front are the chief paddlers setting the pace and then everyone falls into synch with them. 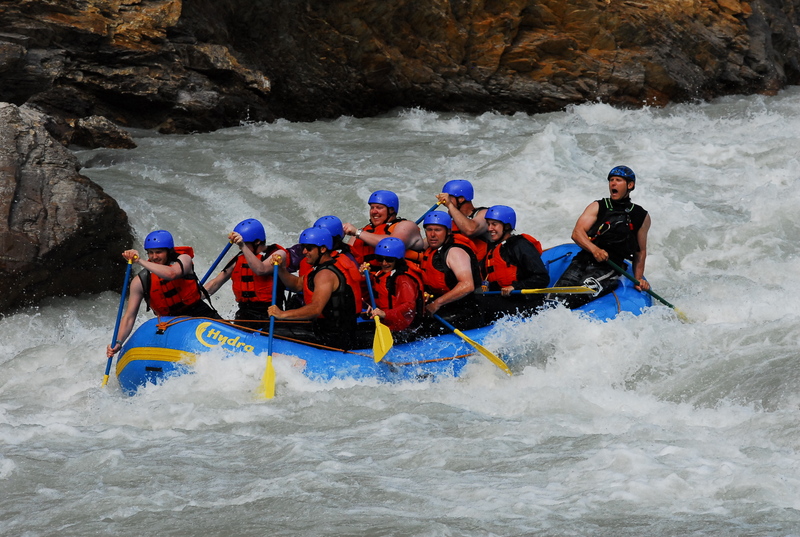 The further back the raft you sit the less impact rapids have on you. 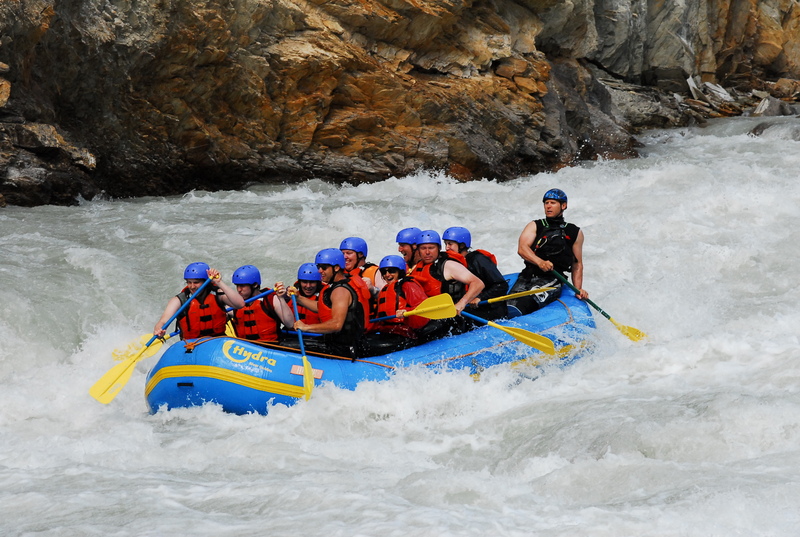 The further up the more likely you are to get creamed by the rapids…we sat at the front….it was great!!! Our lazy float started to turn into a bit of work as we headed into class 1-2 rapids and we were brought some good thrills and splashing about before the waters calmed. We had a chance to catch our breath and then the big show – the class 3-4 which was super fun. Sadly it only lasts about 600m and then back into a nice lazy float. The spills and thrills on the 3-4 were awesome though!!! Now you can upgrade the tour for $50 a head and do another 4 kms of those mighty beasts. The splash jacket had kept me surprisingly warm and I was keen to go on, however Darek had been without a splash jacket and was pretty frozen so we decided that would be another trip for a different day. There really is nothing like the thrill of seeing the awe inspiring fury of water coming at you head on, the rocky canyon walls on either side and the guide screaming “Paddle hard”!! Paddle- are you crazy? haa haaa…I can’t even sit upright! For a beginner this was definitely a great start and I really look forward to doing some more class 4 and up in the future.